Exciting news at one of our favorite Hunger Games merchandise sellers today! For Cyber Monday only (that’s today, December 8), get 30% off of all of their Hunger Games merchandise when you use code ALLGIFTS. That is NOT the same code that is on the site. It is one that we found for our readers! Some of the merchandise is already on sale, and you get to take the 30% off in ADDITION to those prices. We love the shirts, mugs, pillows, and keepsake boxes. They also have water bottles, tote bags, ornaments, jewelry, pajamas, and more. 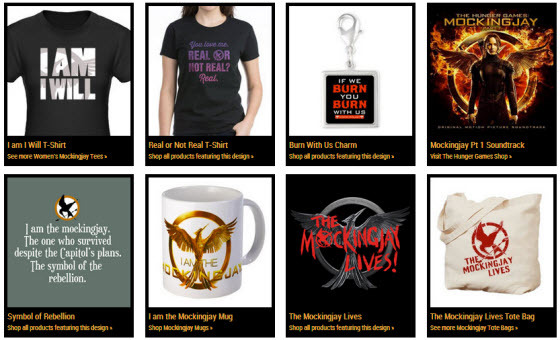 Some of it is official Hunger Games merchandise and some of it is fan-made but authorized through CafePress’ deal with Lions Gate. Head to the Hunger Games section of CafePress today and use that coupon code ALLGIFTS to order your Hunger Games merchandise at some of the lowest prices we have seen this year!